A special explanation of this plaque and the men it commemorates. The Leicestershire Yeomanry was formed on the creation of the Territorial Force in April 1908, one of the major changes introduced by Secretary of State for War Richard Haldane. November 1914: the regiment landed in France and joined 7th Cavalry Brigade in 3rd Cavalry Division. March 1918: left brigade with intention of being converted into a cyclist unit plans changed and the regiment merged with the North Somerset Yeomanry to form a machine gun unit. This was short lived and the regiment remounted. On their arrival in France, the 281 officers and men of the The Leicestershire Yeomanry were reserves and reliefs for the infantry in the trenches. On 12 May 1915 they went into the lines between Ypres and Zonnebreke in front of Potijze to relieve 5th Battalion Royal Fusiliers. At 03.30 hours the following morning, a heavy artillery barrage started which preceded a German assault on the trenches. The assault quickly captured trenches to the left of the regiment occupied by 2nd Life Guards. Having captured the adjacent trenches the Germans began trying to bomb their way into the trenches occupied by the Yeomanry. Eventually the Regiment was forced to evacuate the advanced trenches and at 20.00 hours the yeomanry were the only troops holding a section of trenches which would normally have been occupied by a whole brigade. Reinforcements from the Royal Horse Guards, 10th Hussars and Essex Yeomanry arrived at 14.30 hours the following day. At this juncture a counter attack successfully retook the advanced trenches. The Battle of Frezenburg extracted a heavy toll with 7 officers and 87 other ranks killed which was recognised when the Regiment earned the battle honour of Frezenburg. Lieutenant Colonel, commanding Leicestershire Yeomanry (“Prince Albert’s Own”). He had served in the South African War and was awarded the Queens South African medal with four clasps. Lieutenant, 1st/1st Leicestershire Yeomanry (“Prince Albert’s Own”). He was killed in action on 13 May 1915. He was 40. He was the son of Deborah A and the late T V Turner and the husband of Rachel Margaret Stella Turner of Robin Hood's Bay. He is buried in grave II B 31 Sanctuary Wood Cemetery. He had served in the South African War with the 3rd Yorkshire Hussars in which unit he was Commissioned. He was the son of Arthur and Betsey Barker of One Barrow Lodge, Coalville, Leicester. He was killed in action on 13 May 1915. He was 23. He was the son of Charles Thomas and Georgina De Ville, Tooley Park, Peckleton, Leicester. Private, Leicestershire Yeomanry (“Prince Albert’s Own”). He was the son of Joseph Peter and Sarah Ann Harris, Houghton-on-the-Hill, Leicester. He was the son of Elizabeth Mary Hoyes, Harby, Melton Mowbray, and the late Arthur Hoyes. records that he was shot through the head while bearing a stretcher. His brother Francis Hoyes, MM, Corporal, North Staffordshire Regiment. Army no. 40750 was also killed. He was the son of Mary Thirk (formerly Morley), 94 Leicester Road, Whitwick, Leicester, and the late Joseph Morley. Corporal, Leicestershire Yeomanry (“Prince Albert’s Own”). He was the son of Ellen Powell, 5 Paradise Row, Wharf Street, Leicester, and the late Mr Powell and the husband of Annie Amelia Powell, 35 Willow Street, Leicester. 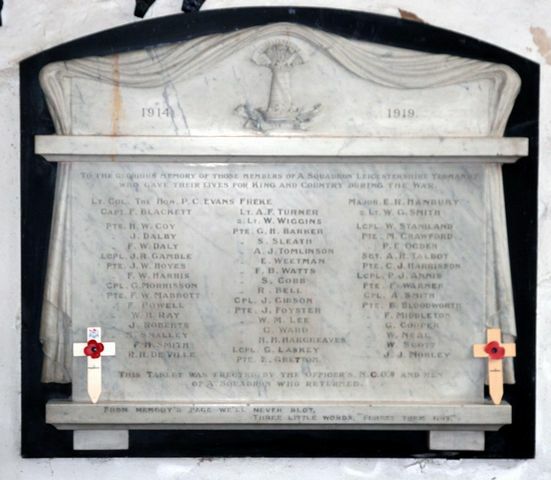 The website http://www.paoyeomanry.co.uk/ records that he was employed by Goward and Son, High Street, Market Harborough on the other hand he enlisted in Melton Mowbray and lived in Harleston, Norfolk where he is remembered on the War Memorial. Did he enlist because the Regiment was in Norfolk in the very early days of the war? He was the son of John and Fanny Sleath, Lutterworth Road, Ullesthorpe, Rugby. He was the son of Charles and Sarah Weetman, 135 Humberstone Road, Leicester. Corporal, 8th Squadron, Machine Gun Corps (Cavalry). on the Somme. He was 30. He died from his wounds on 24 November 1914. He was 41. He was the son of Commander Archibald C S Blackett (RN) and the late Clara B S Blackett and the husband of Kathleen Prudence E Sweny (formerly Blackett) of Arbigland, Dumfries. November and the Regiment had soon entered the fray which indicates what desperate times these were. He died from his wounds on 21 April 1918. He was 25. Albert’s Own”), 7 Cavalry Brigade, 3rd Cavalry Division. Army no. 2219. He was killed in action on 21 January 1916. He was 30. 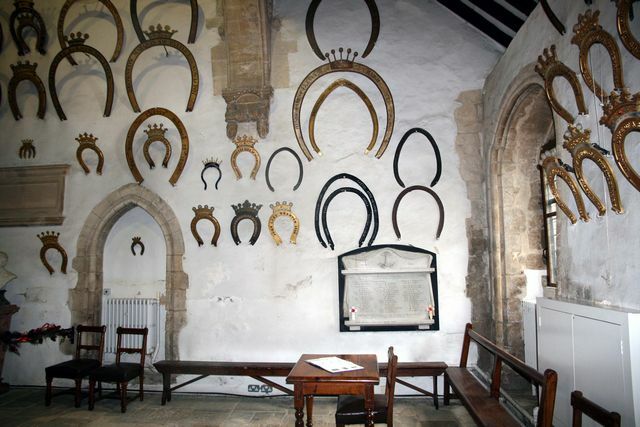 He was the son of Sidney and Anne Cobb, Keeper's Lodge, Trimsaran, Kidwelly, Carmarthenshire. He is remembered on panel 2 of the Loos Memorial which commemorates over 20,000 officers and men who have no known grave, who fell in the area from the River Lys to the old southern boundary of the First Army, east and west of Grenay. Private, Leicestershire Yeomanry (“Prince Albert’s Own”) and then The Corps of Hussars. Army no. 255343. He was the son of Mrs E Cooper of Gumley, Market Harborough and the late John Cooper. He is buried in grave A 12 Villers-Faucon Communal Cemetery. Probate records show that he died in Epehy on 11 June. War Hospital. He was 27. He had been drafted to France on 16 February 1915. Army no. 255456 attached to 5th (Royal Irish) Lancers, 2nd Cavalry Division. He attended Oakham School 1895-1896 and then he moved to Eton. He subsequently attended New College, Oxford. His address for Probate was 57 Draycott Place, Chelsea. He was killed in action on 24 October 1917. He was 26. He is remembered on panel 3 of the Tyne Cot Memorial. He died from his wounds on 23 December 1916. He was 20. He was the son of Arthur Bartrum and Alice C Laskey, 265 Clapham Road, London and the husband of Alice Catherine Beer (formerly Laskey) of Exeter. He died from his wounds on 9 March 1916. He was 26. He was the son of Thomas Wakefield and Edith Emily Lee of Hollywood, Messingham, Lincolnshire. The website http://www.paoyeomanry.co.uk/ has an article from a newspaper which reveals that he received a leg wound from a rifle grenade at Aire sur la Lys, his leg was amputated but the wound became septic. He died from his wounds on 9 June 1918. He was 20. He was the son of Richard John and Emeline Middleton, 49 St. Stephens Road, Leicester. as possible clean water supplies, cooking facilities and billets, de-lousing stations and similar facilities. They came under Corps or Army control from March 1917 onwards. He was killed in action on 9 October 1918. He was 23. He was the son of Thomas William and Emma Neal, 6 Council Houses, Burbage, Hinckley. He was killed in action on 12 June 1917. He was 25. He was the son of Percy Ernest and Edith Ogden of Queniborough, Leicester. He died whilst on active service on 3 November 1918. He was 34. He was the son of Frank and Eliza Scott, High Street, Uppingham and the husband of Nellie Scott, Pine House, High Street, Uppingham. He had enlisted on 2 September 1914. Corporal, A Squadron, Leicestershire Yeomanry (“Prince Albert’s Own”). Army no. 255066 attached to 5th (Royal Irish) Lancers, 2nd Cavalry Division. He was the son of the late W T Smith, 29 Newcombe Street, Market Harborough. He died from his wounds on 22 March 1918. He was 26. He was the son of Joseph and Lizzie Smith, The Willows, Houghton-on-the-Hill, Leicester. There is no soldier or officer of this name who was killed whilst serving with the Leicestershire Yeomanry. I am therefore assuming that this man is the Territorial Officer detailed who had previously served with the Leicestershire Yeomanry as a Private. Army no. 3363. He was killed in action on 22 June 1917. He was 23. He was the son of Arthur J G and May J Talbott, of Waltham, Melton Mowbray. He died from his wounds on 18 April 1916. He was 19. He was the son of Jack and Sarah Ann Ward, 172 Birstall Street, Leicester. He was the son of Adam and Georgina Warner of Kibworth Beauchamp, Leicester. 19 August 1916. He was 23. He was the son of William and Mary Elizabeth Wiggins, 45 Hillmorton Road, Rugby. 1914. He had subsequently been commissioned and joined the Leicestershire Yeomanry.